If Ivy Pochoda never writes another book, this one would be enough to keep her name on the lips of readers for decades to come. On a hot July night in Brooklyn’s Red Hook neighborhood, (named, BTW, for the color of its soil and an erstwhile geographical point, not for the hook-shaped pier that juts out from it today) two fifteen-year-old girls, Val Marino and June Giotta, looking for a little fun, take a small raft out into the city’s upper bay. Only one returns, found unconscious under the pylons of a local pier. There is danger in being in love. When we are in love we tend to lift up the things about our beloved that appeal, while minimizing, if we see at all, the things that do not. My feeling about Visitation Street reminds me of that. There is an air of ecstasy about it, as if I have found The One. And maybe there are flaws that I simply cannot see because of the overwhelming feeling of excitement that I experienced while reading this book. For what it’s worth, I have had this feeling several times in the last few years, with The Orchardist, Caribou Island, Billy Lynn’s Long Half-Time Walk, and Skippy Dies, to name a few. I have not felt any regret about declaring my love for them, and do not expect any regrets this time around. But just so’s ya know. Ahm in luuuuv. My wife understands. This is a magnificent book, very reminiscent in power and achievement to Dennis Lehane’s Mystic River. In fact the book is released under the imprint Dennis Lehane Books, and seeing how reminiscent it is of Mystic River that seems appropriate. Ivy Pochoda has achieved a stunning success in so many ways in Visitation Street that it is difficult to know where to begin. How about characters? Pochoda clearly has a gift for portraying people. Val is struggling to remember what happened that night, and we feel her pain as she travels from forgetting to remembrance. Eighteen-year-old Acretius James, Cree, struggles to overcome the death of his Corrections Officer father, Marcus, and to find direction in his life. He spends a lot of his time on a beached boat left by his dad. Was this boat, seen on a pier off Beard Street, the inspiration for this? Will he remain moored in the rubble of the past or find a way to sail forth? Jonathan Sprouse, a musician and music teacher at a local parochial school, and borderline alcoholic, has a lifetime of descent interrupted by an opportunity to do something worthwhile. He hears the world differently from you and me. The wino’s voice catches Jonathan’s ear. It’s dissonant, all flats and sharps with no clear words. Finally, Ren is a mysterious protector who appears, seemingly out of nowhere, to watch over Cree and Val. (For those who are familiar, think the Super-Hoodie character in the British TV series, Misfits) Pochoda makes us care about every one of these people. She breathes life into them, giving us reasons to want them to succeed. We feel the love for these characters that their creator obviously does. But they are all, well, except for Fadi, damaged people, sinking, needing a life preserver of one sort or another. Val is a basket case after that night. Jonathan was born playing first violin and somehow finds himself at the back of the orchestra. Cree suffers from the loss of his father and Ren has a dark past that has defined much of his life. But they struggle to rise above the waves, and we cheer their efforts. Next is the landscape, which, in this case, is the most significant character in the story. 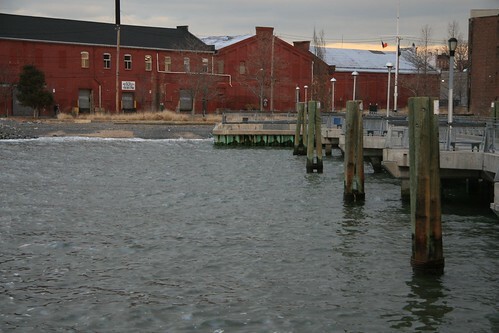 When SuperBitch Sandy raised the ocean’s wrath in 2012, devastating large swaths of the East Coast, it was not the first time that Red Hook had been laid waste. The area had once been the primary entryway of grain to the nation. Large proportions of the nation’s sugar was imported and refined in Red Hook, and a considerable swath of the metro area’s beer was processed there. 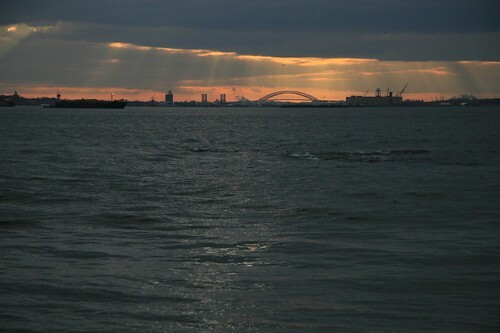 But the dock jobs moved to newer ports, the neighborhood was bisected when Robert Moses carved an elevated trench through it with the construction of the Gowanus Expressway, and the crack epidemic led Red Hook to be declared one of the worst neighborhoods in the nation in 1990. But Red Hook had been making a comeback. A new frou-frou supermarket has been built in a Civil War era waterfront building (it is referred to in the book as Local Harvest, but is in reality a Fairway. I have shopped there and it is fabulous, or at least it was before Sandy destroyed it. It reopened in March 2013) The story is set in 2006. 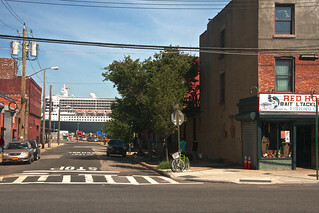 There is now an IKEA in Red Hook, occupying what was an abandoned dockyard at the time of the story. On the next pier down was an abandoned sugar refinery, which was demolished in 2007, so don’t go looking. A cruise ship terminal, imminent for most of the book, is opened by the end. The change in the neighborhood is part of the world Pochoda describes. There is, by the way, a Visitation Place, on which is located a Visitation rectory. We presume that the day care center at which the girls worked is there as well. There is a real Red Hook Gospel Tabernacle to match the one in the story. People were indeed killed in this neighborhood from drug-related gang violence, most notably a school principal who had walked out of his public school looking for one of his students, and took a stray round. In the Red Hook Houses, recently devastated by Sandy, reside some 8,000 people, in less than idyllic conditions. It is still a tough place. So we have amazing characters and a spot-on depiction of a neighborhood in transition from drug center to the next cool place. Next comes plot. There is indeed a compelling mystery, and Pochoda is no less skilled at peeling back the layers in that than she is in revealing her characters, bit by bit. You will want to know what took place and Pochoda will let you know, in due time. Next is the introduction of a dose of magical realism. Cree’s mother, Gloria, has the sight. Enough of a talent to spend countless days talking (visiting?) with her dead husband, while sitting on the memorial bench that had been erected to his memory. (This was inspired by the death of that public school principal. A school was named for him. Cree’s father must make do with the bench.) Enough of a talent that locals come to her for help in communicating with their dearly departed. That particular strand of DNA did not come to Cree, but his grandmother and his aunt also have the ability, and there may be another family member in line as well. After that night, Val sees and hears things. Is she losing her mind? She is not alone. How the people visited by these incomings handle the stress of it is a significant element of the tale as well. Is it real at all or merely the self-inflicted manifestation of guilt? The notion of ghosts is prominent here in Pochoda’s Red Hook. Certainly the death of Cree’s father is a spectre that continues to impact both his son and his widow. Jonathan carries with him the burden of a death as well. Val must cope with the death of her friend, and Ren not only has death-related memories that live on for him, but has seen the torment of many others. There wasn’t a goddamned night on the inside when I wasn’t woken by somebody haunted by the person he dropped. Ghosts aren’t the dead. They’re those the dead left behind. Stay here long enough, you’ll become one of them—another ghost haunting the Hook. As he crosses from this abandoned corner of the waterside back over to the Houses he becomes aware of the layers that form the Hook—the projects built over the frame houses, the pavement laid over the cobblestones, the lofts overtaking the factories, the grocery stores overlapping the warehouses. The new bars cannibalizing the old ones. 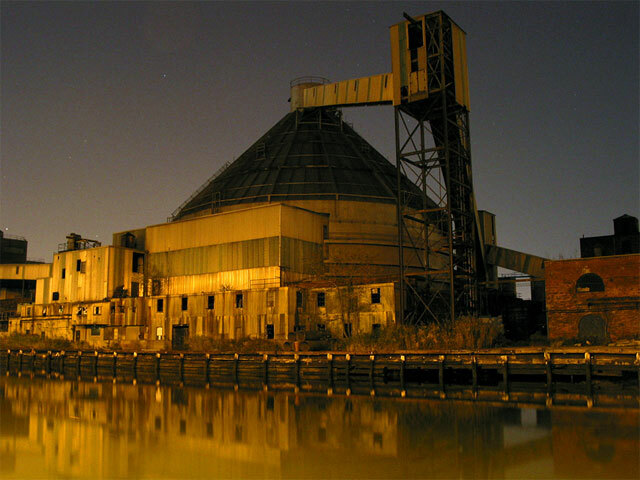 The skeletons of forgotten buildings—the sugar refinery and the dry dock—surviving among the new concrete bunkers being passed off as luxury living. The living walk on top of the dead—the water front dead, the old mob dead, the drug war dead—everyone still there. A neighborhood of ghosts. I expect that by including references to sundry locations that have now moved on to another realm, Pochoda is linking the deaths and births on the landscape with the more human ghosts that inhabit this world. All these incredible characters come to life in this book, even though they are walking through a place as haunted as any graveyard. The final piece here is the power of Pochoda’s writing. Here is a sample. The women grow grungier and sexier the later it gets. Soon they bear no resemblance to the morning commuters who will tuck themselves into bus shelters along Van Brunt on Monday, polished and brushed and reasonably presentable to the world outside Red Hook. Nighttime abrades them, tangles their hair and chips their nails. Colors their speech. At night, the hundreds of nights they’ve passed the same way begin to show, revealed in their hollowed cheeks and rapid speech. Jonathan wonders how long it takes for their costumes to become their clothes, their tattoos their birthmarks. When will they let the outside world slip away and forget to retrieve it? Really, what could possibly be added to enhance that? Ok, there have to be a few chinks in the armor here, somewhere, right? I looked pretty closely at the geography of the events, and it seemed a stretch. For example, did Jonathan really carry the unconscious Val eight blocks to Fadi’s? Well, he is a young guy, 28, 29, so yeah, I guess it is possible. There is no inpatient hospital in Red Hook, and I have not yet found out whether there was one there in 2006. But I continue to search. The four-corners location which includes Fadi’s bodega appears to be located not at the intersection of Visitation and Van Brunt, but a block away at Pioneer Street. These are small items, and I have no trouble with the author using a bit of elastic geography to support her story. 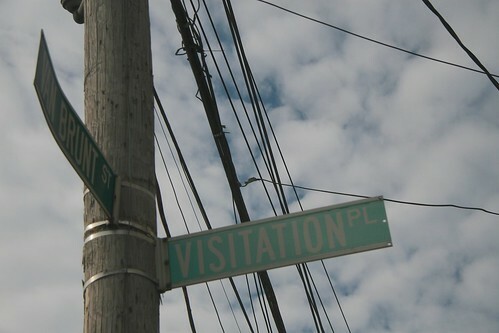 Certainly “Visitation “works better than “Pioneer,” the actual name of the street where the bar and bodega intersect Van Brunt, particularly as characters here are visited, in one way or another. This not a book you will want to begin before bedtime, as you may find yourself reading straight through and costing yourself a good chunk of a night’s sleep. We are in can’t-put-it-down territory here. And you might want to have a good cardiologist nearby when you finish reading this book. It’s gonna break your heart. It’s no secret. I love this book. But I’m a modern guy and this is not an exclusive love. I am more than happy to share. Don’t let this one sink beneath the waves of your attention. Reach in and pull it out. This is simply an amazing book. You must read it. A writing teacher of mine once told me that names should be simple but also stand out. Cree (Acretius) is the name of a guy I met when I was 11. He was older (19), black, and represented a teenage world that I couldn’t really imagine. It just stuck with me. Val was originally called Viv which seemed too old. Jonathan (based on someone named William who really looks like a Jonathan) was named for that reason and after a music teacher I had in high school. 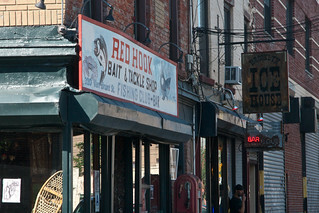 I truly meant to capture the ghostliness of Red Hook…Red Hook was as much a character for me as any of the real live people. In my first draft I was writing about the neighborhood more than the people in it, which wasn’t so hot in terms of plot. I lived, as I mentioned on Pioneer and Van Brunt. 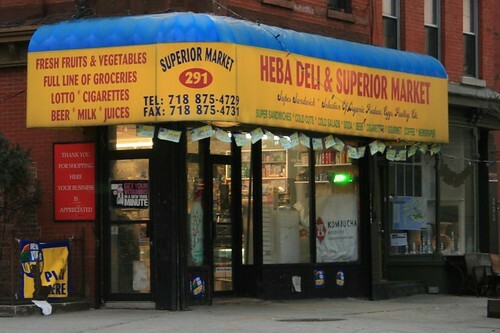 The Greek’s cafe was downstairs and Heba / Hafiz deli was across the street. There’s a Catholic School on Summit and an abandoned one on Henry (I think) that I used as inspiration for St. Bernardette’s. Though in all honestly, some of the interior of St. Bernardette’s is based on my school, St. Ann’s on Pierrepont St. 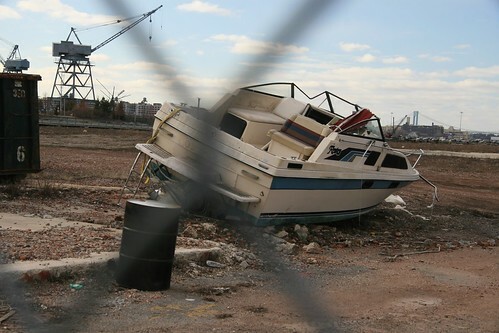 However, the boat was on Lorraine St closer to the projects. How the hell did it get there? That was super strange. It’s so far from the water. The Bait & Tackle most certainly is the Dockyard. In fact, I’ll be doing a reading there this summer. I can’t wait. I really made up all the artwork in the book — Ren’s murals etc. There’s no basis in real Red Hook graffiti there. Maybe soon! I’m in LA now and it’s getting harder and harder to write about Brooklyn. I am tooling around with a book set here. Wish me luck! Best of luck, Ivy. Although with talent like hers, I doubt she will need much. After reading this book, you might want to keep up with Ivy, so here are links to her website and FB Page. Ok, I got a little funny in the head, (love will do that to a guy) trying to trace the movements of the characters here. Along those lines I employed Google and made a map that shows many of the locations identified in the book. In addition to the images I splashed all over this review, there are more, on Flickr.com. 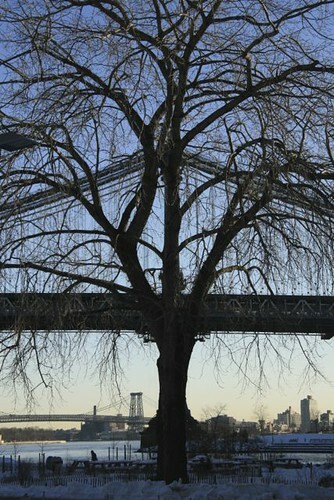 Some relate to the book more than others, but all the shots in this set were taken in Red Hook. 3/30/13 – I came across this piece in the NY Times re what the Real Estate types, in a bit of the location renaming that is a plague here, are calling the “Columbia Waterfront District.” Get over yourselves, people. It is still Red Hook. There are some nice shots in the linked slideshow though. 7/4/13 – You must check out a video on Ivy’s site, in which she talks about Red Hook and some of her inspirations for elements of the novel.